2018 November 15 - I will be presenting on "A High-Resolution Future Wave Climate Projection for the Coastal Northwestern Atlantic" at the JSCE 65th Coastal Engineering Lectures (Tottori, Japan). 2018 November 14 - "Impact of the four-wave quasi-resonance to freak wave shapes in the ocean" has been published online in Ocean Dynamics. I am interested in modeling geophysical flow for a wide range of scales using the latest advances in mathematical and numerical analysis. 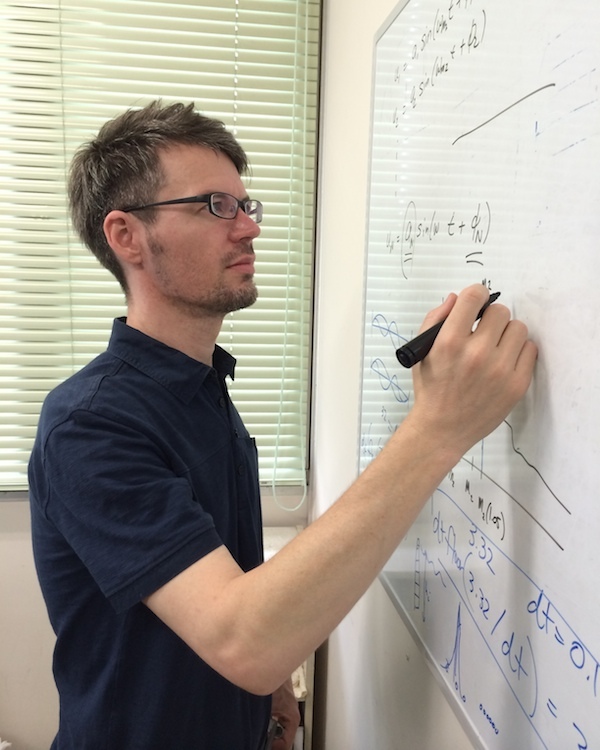 I am currently investigating waves and storm surges on long time scales in a coupled climate system for the Japanese government-funded Tougou Project (Theme D led by Eiichi Nakakita). While at The University of Tokyo, I worked with Takuji Waseda on a NEDO project to estimate the available wave energy resources for Japan to assist with wave generator site identification and construction. The completed assessment can be accessed here and is based on a 21-year, high-resolution NOAA WAVEWATCH III simulation. I also worked on an Arctic Challenge for Sustainability (ArCS) project to forecast the wave field for the rapidly changing Arctic climate. While at the Tokyo University of Marine Science and Technology, I worked with Hidekatsu Yamazaki to model the generation and dissipation of nonlinear internal tidal waves in a ria estuary using the 3D nonhydrostatic coastal model SUNTANS. This work was part of a larger project to study the impact of the 2011 Tohoku earthquake and tsunami on the ecosystem of Otsuchi Bay, Japan. For part of my thesis, I worked with Baylor Fox-Kemper to derive a new set of approximations for Stokes drift and optimize an ocean surface wave model component for coupling with the NCAR Community Earth System Model (using NOAA WaveWatch III). In addition, I worked with Natasha Flyer to develop a fast meshless wave model specifically designed for coupling with global climate models. Results from the prototype can be found in my dissertation. Stokes drift functions for different depth-dependent and depth-integrated approximations can be found here and on the MATLAB Central File Exchange. The functions use either 1D or 2D wave spectra and can handle an arbitrary number of spatial and temporal dimensions. A detailed description of the different approximations can be found in this publication (and respective preprint). 2018 "Impact of the four-wave quasi-resonance to freak wave shapes in the ocean." 2018 "Development of waves under explosive cyclones in the Northwestern Pacific." 2018 "Predictability of storm wave heights in the ice-free Beaufort Sea." 2018 "Correlated Increase of High Ocean Waves and Winds in the Ice-Free Waters of the Arctic Ocean." 2017 "A three-dimensional numerical study of river plume mixing processes in Otsuchi Bay, Japan." 2017 "Statistical Models of Global Langmuir Mixing." 2016 "Marine energy resource assessment at reconnaissance to feasibility study stages; wave power, ocean and tidal current power, and ocean thermal power" (in Japanese). 2015 "Symmetric and Geostrophic Instabilities in the Wave-Forced Ocean Mixed Layer." 2015 "Langmuir mixing effects on global climate: WAVEWATCH III in CESM." 2015 "Impacts of wave spreading and multidirectional waves on estimating Stokes drift." 2011 "Wave spectral moments and Stokes drift estimation." 2018 "A High-Resolution Future Wave Climate Projection for the Coastal Northwestern Atlantic." 2018 "Comparison of long-term trends of the largest waves in the ice-free Arctic waters from different reanalysis products." 2017 "Arctic Wave Observation by Drifting Type Wave Buoys in 2016." 2016 "A High-Resolution, Wave and Current Resource Assessment of Japan: the Web GIS Dataset." 2018 "Report of the 2018 Meeting for the WCRP-JCOMM Coordinated Ocean Wave Climate Project (COWCLIP), Paris, 21-23 May, 2018." 2017 "WAVEWATCH III in CESM and Langmuir mixing." 2013 "Stokes Drift and Meshless Wave Modeling." 2018 "Robustness and uncertainties in global multivariate wind-wave climate projections." J. Morim, M. Hemer, X.L. Wang, N. Cartwright, C. Trenham, A. Semedo, L. Bricheno, P. Camus, M. Casas-Prat, L. Erikson, L. Mentaschi, N. Mori, T. Shimura, B. Timmerman, O. Aarnes, Ø. Breivik, A. Behrens, M. Dobrynin, M. Menendez, J. Staneva, M. Wehner, J. Wolf, B. Kamranzad, J. Stopa, A. Webb, I. Young, and F. Andutta; Nature Climate Change, submitted. 2018 "RBF-FD method for a multiple scale system: global ocean surface waves." A. Webb, N. Flyer, and B. Fox-Kemper; in preparation for submission. 2018 "A high-resolution, long-term wave resource assessment of Japan with wave-current effects." A. Webb, T. Waseda, and K. Kiyomatsu; in preparation for submission. I am currently not doing any teaching at this time. Previous university courses and programs are listed below.